“The tough thing about Crimes of Paris (as in many EC songs) is that he’s actually only playing five chords on the guitar, but the changes in the bass notes and the vocals are what you really hear. So, if you play it by yourself the way EC does on the album, it sounds like you’re missing a lot of important changes – and you are. itself very dissonant, as the B isn’t part of an Am or Am7, but in context it sounds great. The end of the bridge is really strange with the same line continuing through D D# E with the Beatles-like chanting going on against it-I don’t know what to call those chords. Well guys, I can exclusively reveal to you that it wasn’t! 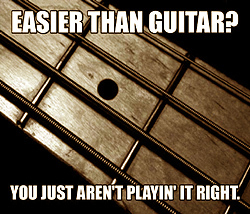 Maybe it had more to do with the bass player trying to make the chords sound more interesting. As someone (who was accused of being me, though it wasn’t) said recently: Elvis may have written the book, every day, but it was the Attractions that designed to cover, chose the font and did the illustrations. You must still be sufferingthe effects, it was a glue factory! as I say strange venue! Since we are officially entering the holiday season…have you ever played on any Christmas recordings? I’ve played on recordings done at Christmas — but can’t recall a new wave version of ‘Jingle Bells’. Beautiful condition ’73 SVT just came in. Nicest I’ve seen in some time. Sweet. Put it to one side for me. Did you have to buy your stage amps or did the “Company” help with that? I thought it was a bit humorous in EC’s book that he didn’t use the name “Peavey” but referred to them as “Mississippi amps”. Why d’he do that? Didn’t want to give them any publicity? All I could guess would be him trying to be clever so the reader would have to Google it, or he’s concerned about lawyers which would be equally silly. None of us much cared for Peavey amps, me especially — never liked 15″ speakers for bass. Very solid state sounding. I though EC was very complimentary of the Attractions in his McManus family history book. I’m pleased to hear it — I’m sure you’d alert me to any transgressions. Have you had the opportunity to review the aforementioned tome? (a book, especially a large, heavy, scholarly one). Yes, I’ve had ‘the opportunity…’. I think the Spinal Tap “There’s a fine line…” applies here. But really only in regards to his non-linear format. And, only in regards to his non-linear format and extraneous material. …and no index — there’ll be no cherry-picking here! Psst, I got the Kindle version of the “MacManus Family History & Other Stories” book. Don’t need an index, you can use the search function. It’s also cheaper, at least where I live. In the latest Mojo (the one with Bowie on the cover) EC recommends an album of Albanian folk tunes from 1928. I am not making that up. Mind you, he may have a point… have you heard what’s on the charts lately? Which is the extraneous material? Just listening to it now: you’re making most of that bass up as you’re going along, aren’t you? It’s full of ‘impossible’ notes. But that’s what I love about The Attractions: a self-confident very adventurous bass. Anything is possible and it’s way way out of its safety zone. It’s melodious, strong and pushes the limits. I’m a bit reluctant to disappoint you — but the notes were fairly considered rather than random. I was playing a bit with disonnance at the time — much to the annoyance of several people who’d booked me for session work 🙂 There’s a track on a Peter Case album where I detuned the bass strings and then tried to bend the notes into pitch. That’s a very interesting and very difficult way to go about things! But like I said, I love the bass to push boundaries, so whichever way it was conceived – through design or complete abandon – I love the effect! There’s also some interesting “strange chords” in the middle eight of “Blue Chair”, which I definitely attribute to Mr Bass Player. While the drums were actually Steve tapping his feet! I always thought the drums were Nick Lowe tapping on the control room window, and the guitar was being played by a man with a musical chainsaw. The secret is that it’s musical flatulence — and it’s his other end that’s miked up. Pardon my ‘end-of-term’ levity. I’d say Bob Dylan’s musicians did a lot towards shaping the songs and creating the sound of his albums during the early electric phase. That’s an interesting pick. I don’t really disagree with you but from the release of the bootleg series he seemed eager to explore the songs and let them find their own life so to speak.. Have you listened to any of these releases? I think they’re fascinating and really great to listen to. My pick would be the Rumour. I think they really lifted Graham’s game although he still had flashes of brilliance at times without them. I haven’t listened to Bob Dylan bootlegs since the ‘Judas’ days! Bob Dylan had a good line that ‘a song is anything that can walk on its own’. But the Band obviously brought something to the table — as did the Al Kooper and Mike Bloomfield ensemble. Yes, the Rumour played above and beyond the call of duty.